This is an archive of our members' exploits in individual events from 2010 through to mid-2015. From mid-2015 onwards such news will appear on our home page and will be supplemented by the news from our twitter feed. Its the summer of 2015 so it must be time for the Surrey Individual competitions again! Surbiton have a total of 22 entrants to the various competitions at all levels. That's huge! Follow our progress here. Challenge Cup, Slater-Kennington Cup, Felce Cup, Wernick Cup. The Delancey UK Schools Chess Challenge Surrey Mega-Finals on 2-4th May 2015 featured Neirin Leggett (5/6) taking equal 2nd in the Boys U-11 "A" section and Daniel O'Malia (5/6), who was equal 1st in the U-11 Boys "B" section. Koby Kalavannan took outright first (6/6) to become the U-13 Supremo and Morayo Ogungbesan took equal 3rd (4/6) in the U-14 section. Here are all their results. Hari Stewart made a score of 5/6 to take equal second in the Boys U-8 "A" section. The Golders Green Rapidplay on 9th May 2015 saw Koby Kalavannan tied for 2nd place in a very strong field with 4/6. Koby managed to beat GM Tamas Fodor (Elo 2497) along the way in an impressive performance. The SCCU County Championships run between October 2014 and March 2015 resulted in second place for the Open team in which Mark Josse, Steven Jones and Paul Shepherd featured. The U-100 and U-120 teams, both featuring Morayo Ogungbesan, also came second and so there will be Surbiton interest in the ECF National Stages once again this year. On 22nd February 2015 the Wilts and West of England Juniors was the scene of a triumph in the U-8 section for Rahda Ratnesan who shared equal 1st with 5/6. Hot on Rahda's heels was Hari Stewart who tied for 3rd with 4.5/6. Also competing were Rajeiv Ratnesan who scored 4/6 in the U-12 section and Koby Kalavannan who made 3.5/5 in the U-14 section. Meanwhile Ranesh Ratnesan cleaned up with outright 1st place on 5.5/6 in the Minor. The 21st South of England Juniors played over 31st January to 1st February 2015 saw Hari Stewart and Radha Ratnesan tied for equal 4th with 4/6 in the U-8 section. Meanhile Rajeiv and Ranesh Ratnesan tied in equal 6th place with 3.5/5 in the U-11 section and Koby Kalavannan grabbed yet another first place to win the U-14 Closed section. The 5th Golders Green Congress played on 17-18th January 2015 saw Steven Jones and Koby Kalavannan take joint second prize with 4/5 in the Open. The famous Hastings Chess Congress took place from 29th December 2014 to 6th January 2015 and worked out very successfully for a couple of our junior members. In the Weekend Major Koby Kalavannan took 1st place with 4.5/5. That same score got Ranesh Ratnesan a joint 1st place in the Weekend U120 event. The Northwick Park Congress played host to the London Junior Championships from 28-30th December 2014. The U-21 Championship has long been incorporated into a FIDE Open. Michael Basman came joint second with 4.5/6 followed closely by Koby Kalavannan with 4/6. Also competing in the U-8 section were Hari Stewart (joint 3rd with 5.5/7) and Rahda Ratnesan (4.5/7). The London Chess Classic played on 6-14th December 2014 had a different format including a SuperRapidplay event which James Holland (6.5/10), Michael Basman, Koby Kalvannan (both 6/10) and Tony Stewart (5.5/10) competed in. The Weekend Classic Open saw Michael Basman make a 3.5/5 score. While Steven was battling it out in Leicester the Hampstead U2200 Congress was running from 29-30th November 2014 and Koby Kalavannan scored 4/5 for a share of second place. The H.E.Atkins Memorial Leicester Congress Open ran between 28-30th November 2014 where Steven Jones took joint 3rd with 3.5/5. The summer of 2014 once again saw the Surrey Individual competitions feature strongly in the Surbiton players' calendar. Thirteen of our players featured in the various sections. Koby Kalavannan made his debut in the very tough Challenge Cup. Meanwhile Surbiton collected all the other pots on offer. Paul Durrant was joint winner of the Slater-Kennington Cup, Stephen Moss won the Felce Cup and Ranesh Ratnesan was joint winner of the Wernick Cup. Great effort by you all! The Delancey UK Schools Chess Challenge Tera-Finals and Challengers events took place on 16-17th August 2014. In the Challengers A Koby Kalavannan was fourth overall and 2nd in his U-12 age category while in the Challengers B Ranesh Ratnesan was joint top of his U-9 age category. There was plenty of Surbiton representation and success at the 101st British Chess Championships held in Aberystwyth between 19th July and 2nd August 2014. Koby Kalavannan repeated his success last year by coming equal first in both the U-12 and U-13 Championships with 6 and 5.5 points out of 7 respectively. Koby also made a creditable 5/11 in the Major Open.The Ratnesan family was very well represented at the championships too. Ranesh made 6/7 in the U-9 section and 5.5/7 in the U-10 event, both of which were sufficient for second prize in each category. Ranesh's brother, Rajiev scored a useful 4/7 in the U-10 event and, to complete the family picture, Rahda played in the U-8 event and made 3/6. Quite a family plus score! Steven Jones was also a busy man at the championships. Steven scored a useful 5.5/11 in the Championship Open, 3.5/6 in the Rapidplay Open and topped it all off nicely by winning the Week 2 am Open with 4.5/5. To complete the seriously healthy Surbiton plus score for the event Stephen Moss made 3/5 in the U-140 section. Well done to everyone! The Delancey UK Schools Chess Challenge Giga-Finals took place 0n 12-13th July 2014. A number of Surbiton Chess Club junior members participated. Ranesh and Rajiev Ratnesan came 2nd in the Boys U-9 "A" and U-10 "B" sections respectively while Daniel O'Malia took equal second in the Boys U-10 "C" section which also featured Neirin Leggett, who was equal 5th. The same day Hari Stewart was equal 5th in his Boys U-7 "B" section. Rahda Ratnesan won the U-7 girls section to become "Ultima" and the same day Koby Kalvannan was second in the U-12 boys "B" group and Morayo Ogungbesan was also 2nd in her Girls U-13 section. When the music stopped on 30th June 2014 to determine the ECF Grand Prix winners Koby Kalvannan found himself in 7th place. However that was not in the Junior section, it was in the Open and he had a number of Grandmasters for company in the results table! Koby also came fourth in the Junior Grand Prix and both Steven Jones (Open) and Ranesh Ratnesan (Junior) achieved high finishes too. Ranesh Ratnesan competed in the e2e4 Sunningdale U-1650 event during May 23-26th 2014 and made 4/7 including a win against the eventual tournament winner. The Delancey UK Schools Chess Challenge Surrey Mega-Finals on 3-5th May 2014 saw Hari Stewart crowned "Supremo" with the perfect score of 6/6 in the Boys U-7 "A" section. The title "Supremo" also went to Daniel O'Malia (6/6) in the Boys U-10 "A" section and to Koby Kalvannan (5.5/6) in the U-12 Boys section. Meanwhile, Neirin Leggett with 5.5/6 was joint second in the U-10 Boys "B" section. Results for Daniel, Koby and Neirin. To complete the Surbiton winners list, Rahda Ratnesan won the Girls U-7 section with 6/6 to become "Suprema". The 37th Surrey Easter Congress on 21st April 2014 saw Hari Stewart come 1st and Rahda Ratnesan come 2nd in the U-7 section. The SCCU stages of the County Championships once again saw several Surbiton participants between October 2013 to March 2014. In the Open team Paul Shepherd scored 3.5/4 and Steven Jones 2.5/3. Mark Josse and Koby Kalavannan also played and overall Surrey came 3rd in the SCCU but that was enough to qualify once again for the National Stages. Koby also made 1/1 for the U-180 team. Alicia and Ian Mason featured in the U-160 team as did Stephen Moss (1/1) for the U-140 and Morayo Ogungbesan for the U-120 and U-100 teams, in the latter of which she achieved 2.5/4 on top board. The Surrey teams in the National stages also featured several Surbiton players. The Open team got to the semi-finals and included Mark Josse and Steven Jones. That was also as far as the U-180 team got where we had Angus James flying our flag. The U-100 team got as far as the quarter finals with Morayo on top board. Koby Kalavannan took second place in the Major section of the Golders Green Rapidplay on 8th February 2014. The World Junior Championships were held in Al Ain, United Emirates between 17-29th December 2013. Koby Kalavannan competed in the U-12 section and achieved a very creditable 6/11 score. The London Chess Classic played on 7-15th December 2013 featured a number of Surbiton entrants. In the FIDE Open Mark Josse and Angus James made 5 and 4.5/9 respectively. The Weekend A Open saw Steven Jones take 2nd prize with 4/5 while Mike Basman and Koby Kalavannan made 3/5 and that also gave Koby the U-175 prize. The Weekend B U1800 section featured Stephen Moss who scored 3/5. Steven Jones also competed in the 8th December Blitz and took 2nd prize with 5/7. The e2e4 Gatwick Open played on November 1st-3rd 2013 saw both Steven Jones and Koby Kalavannan score 2.5/5. At the same venue the Ratnesan brothers contested the U-1700 event which saw Rajiev scoring 3/5. 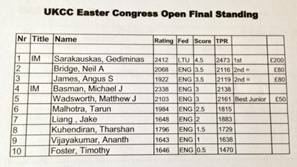 The Open section of the Imperial College Congress ran from 18-20th October 2013 and saw Steven Jones tied for 3rd place with 3.5/5. Koby Kalvannan took a share of the U-2000 prize with 3/5. Steven Jones competed in the e2e4 High Wycombe Open congress during October 11-13th 2013 and made 2.5/5. Over 17th-18th August 2013 Koby Kalavannan’s journey through the Delancey UK Schools Chess Challenge ended in great success when he became the U-11 champion in the TeraFinal. This link gives an interesting overview of the UK Chess Challenge junior scene, some games, some photos as well as the results. Well done Koby! The British Championships in Torquay between 28th July and 10th August 2013 saw several Surbiton participants and some prize-winners too. Mike Basman won the Atkins weekender with 5/5 and Koby Kalavannan continued his great summer by winning the British U-11 title with 6/7 and tied for best British U-12 boy with 5.5/7. Also participating were Steven Jones who made a solid 5.5/11 in the Open and Stephen Moss who also made 50% (2.5/5) in the U160 event. Surrey Open team became National Champions for the second time in three years on 13th July 2013 by avenging their defeat in the Final by Middlesex the previous year with an equally narrow 8.5-7.5 victory. Chris Briscoe, Mark Josse and Paul Shepherd all played for Surrey in the final. Good results on 7th July 2013 in the Southern GigaFinal of the Delancey UK Schools Chess Challenge for Morayo Ogungbesan who was third equal in the U-12 girls section with 4/6 and Max Elliott who was also third equal with 4.5/6 in the U-11 boys “A” section. Koby Kalavannan got a great result as he participated in the U-11 boys “C” section which he won with 5/6 to become “Ultimo” and thereby qualified for the TeraFinal. Over the summer of 2013 Surbiton once again hosted the Surrey individual competitions. We were the only venue where all of the playing strength sections were hosted. There were a total of fourteen Surbiton participants in 2013. Well done to Koby Kalavannan, Gonzalo Shoobridge and John Sugden who all won their respect sections to get to the play-off finals against the other section winners. Especial congratulations to Koby who won his final play-off to win the Slater-Kennington Cup. The third year in a row that a Surbiton player has achieved this! On 30th June 2013 it became official that Koby Kalavannan had won the English Chess Federation Junior Grand Prix which had run from 1st July 2012. Surrey Open team once again won their way through to the ECF National Final after defeating Lancashire 10-6 in the semi-final on 8th June 2013. This had been preceded by an equally impressive quarter-final victory against Yorkshire by 10-4 on 19th May 2013. Chris Briscoe featured in both matches and did the business with 2/2. This is the third year in succession that the Surrey Open team has reached the ECF National Final and they will face Middlesex (their final opponents last year) on 13th July 2013. The e2e4 Sunningdale congress of 24th-27th May 2013 had three Surbiton entrants in the U2050 section. Angus James scored 4/7. Both Steven Jones and Koby Kalavannan scored 3.5/7. Koby Kalavannan was the U-11 Supremo in the Surrey MegaFinal of the UK Chess Challenge on May 6th 2013. He now moves on to the Southern GigaFinal. April 1st 2013 was the date for a short version of the Surrey Easter Chess Congress and saw Koby Kalavannan win the U-11 championship with 4.5/5. The Hinchley Wood Easter Chess Congress played over 29th-31st March 2013 saw Angus James capture 2nd prize in the Open Section with 3.5/5. Angus thereby sneaked a place above our very own Michael Basman who scored 3/5 (and organized the event!). See table below. The SCCU Open division was decided on 16th March 2013 when Middlesex defeated a frankly rather under strength Surrey side (these things happen as any captain will explain to you). Surrey came second in the SCCU Open and qualified for the ECF stages once again. Surbiton contributions included 2/2 from Steven Jones, 1.5/2 from Paul Shepherd and Angus James also featured. Angus also made 1.5/3 in the SCCU 180 section and Paul Durrant also featured for Surrey in that team. Nice to see Gary Inglis make his debut for the U160 team with a couple of games as well as Morayo Ogungbesan’s debut by turning out twice for the U120 team. Malcolm Cooper’s 2/4 for the SCCU U100 team was also noteworthy and it’s a shame they could not raise a team to compete in the later ECF stages having done enough to qualify. That leaves all Surrey’s hopes for National stage silverware with the Open team. The e2e4 tournament in High Wycombe on 8th-10th March 2013 saw Steven Jones score 2.5/5 in the Open. In the U2000 section Koby Kalavannan scored an impressive 4/5 thereby tying for second place. Through February 15th-19th 2013 Chris Briscoe participated in the far away and exotic 2nd Guam International Open and gained joint second place overall with 7.5/9. Chris’s full report can be found in the May 2013 edition of Chess Magazine. Four Surbiton players entered the Imperial College Chess Congress staged during 1st-3rd February 2013. In the Open section, Steven Jones scored 3/5 and Angus James 2.5/5 (and drew with each other in round 3). In the Major section, Stephen Moss and Koby Kalavannan featured. Congratulations to Stephen Moss who shared first place in the 18th – 20th January 2013 e2e4 Chester Minor with an unbeaten 4/5. The London Junior Chess Championships held in December 2012 featured Koby Kalavannan who finished equal first with a score of 7/9 in the U12 major section. This performance also made Koby the SCCU Boys U11 Champion. Koby also score 3.5/6 in the U14 Major. Featuring in the U12 minor section was Morayo Ogungbesan who scored 6/9 to get equal fifth place overall and jointly winning the leading girl trophy in that section. In the FIDE U18/21 Open Steven Jones scored 3/6 in a challenging field. The Northwick Park Open ran alongside the junior events and saw Michael Basman score 3.5/5 to take equal second. The London Chess Classic Open, which was played between 1st-10th December 2012, featured Mark Josse who scored a good 5/9 in a strong field. Angus James scored 2.5/5 in the Weekender B Open. The November 2012 Brighton e2e4 Open saw Steven Jones score an impressive 4/5 to take sole 3rd place. The Basingstoke e2e4 Major 27th-31st October 2012 saw Anna Purvis score a very good 6/9 to take joint 3rd place. 27th October 2012 saw both Angus James and Paul Durrant achieve draws in the Surrey U180 team’s convincing win against Sussex . Angus also made his debut for the Surrey Open team during the 2012-13 season. Steven Jones made a winning start in his Surrey Open team debut on 6th October 2012 against Sussex . Chris Briscoe scored a nice 4/5 to take joint 2nd place in the 4th Worcestershire Open on 21st-22nd July 2012. The ECF National Counties Finals were held in Leicester on 7th July 2012 with the Open Final being contested by Surrey and Middx. It was a very close match which was eventually and deservedly won by Middx 8.5-7.5. Chris Briscoe drew on Board 3 and Paul Shepherd won on Board 13 but it was not to be for the team overall. Over the season Chris made 2/3 and Paul made 4/6 for the Surrey Open team. Paul was quite pleased with his game in the Final. On 30th June 2012 Paul Shepherd joined the Surrey County Chess Association board as a non-executive director. The Surrey Open team travelled to Horsham to play Sussex in the ECF National Counties semi-final on 9th June 2012. Both Mark Josse, who won on Board 9, and Paul Shepherd, who drew on Board 14, played in a convincing 11-5 victory to take the Surrey Open team to the final for the second year running. On the same day the U180 team's run came to an end in the semi-final against Middx. Angus James notched up 3/5 for them this campaign. The U140 team also met their Waterloo in the semifinal against Lancashire on the same day. Alicia Mason scored 2/2 and Koby Kalavannan scored 1/2 for them this term. Koby also notched up 3/3 for the U120 team in the early part of the season. Max Elliott also featured on Board 1 for the U120 team on three occasions. Malcolm Cooper made 1.5/4 for the U100 team. Its good see a range of Surbiton members playing for the county and I hope more will be inspired by our recent successes. Mark Josse scored a useful 5.5/9 at the e2e4 London Diamond Jubilee Congress Premier at Gatwick from 2nd-6th June 2012. The summer of 2012 once again saw Surbiton host several sections of the Surrey individual competitions. There were a total of fourteen Surbiton participants. Angus James came joint second in the Surrey Challenge Cup. Many congratulations to Steve Kearney who followed Angus’s success in 2011 by winning the Slater-Kennington Cup after a 1.5-0.5 play-off win. Surbiton also had participants in the Felce Cup and Wernick Cup. The Richmond Rapidplay of 20th May again featured Koby Kalavannan in the Major where he scored 3/6. 19th May 2012 saw Chris Briscoe, Mark Josse and Paul Shepherd travel to Cossington, Leicestershire, to play for the Surrey Open team in the ECF National Counties quarter-final. Paul was pretty pleased to be acting captain for the day as we ran out 9.5-6.5 winners against a strong Lancashire side. 10 year old junior Max Elliot represented England at the World Schools Individual Chess Championships in Romania from April 28th - May 6th, 2012. Well done Max! The Richmond Rapidplay of 11th March 2012 saw Koby Kalavannan successfully jump up a level to the Major, where he scored 3.5/6. At the same event Ayse Karel scored 3/6 in the Intermediate. On 4th February 2012 the Surrey Open team beat Kent 10-6 to retain the Southern Counties Chess Union Trophy with a match to spare. Mark Josse (Board 6) and Paul Shepherd (Board 13) played for Surrey. The 15th January 2012 Richmond Rapidplay featured Paul Shepherd making 3/6 in the Open and Koby Kalavannan scoring an excellent 4.5/6 to take joint third place in the Intermediate section. The 2011-2012 Hastings tournament saw Chris Briscoe playing in the prestigious Masters event and making a creditable 5/9 score. The webmaster turned up to see Chris play the first two rounds in which he unfortunately lost to start with 0/2. However, as soon as the albatross departed, Chris made a strong comeback for the rest of the tournament! Alicia Mason also played at Hastings in the Christmas C tournament and got a very good second place result with 4/5. During 3rd-11th December 2011 Mark Josse played in the London Chess Classic FIDE Open and made a creditable 4.5/9 score against tough opposition. The Richmond Rapidplay on 11th November 2011 saw Ian Mason score 3/6 in the Major while Ayse Karel also participated in the Intermediate section. Bonfire night on 5th November 2011 saw Surrey's Open team toast Sussex by 13-3. Mark Josse drew on Board 6 but Paul Shepherd lost on Board 13. Sometimes you just need to hold your hand up and say "well played" to your opponent! The Gatwick International Premier in October 2011 saw Mark Josse score 4.5/9 in a strong field. On 1st October 2011 both Chris Briscoe (Board 4) and Paul Shepherd (Board 15) won for Surrey against Middlesex in the Southern Counties Chess Union Open league thereby making important contributions to an overall 8.5-7.5 win for Surrey. The annual North vs South of the Thames Valley chess match for the Elam Trophy took place at Surbiton on Saturday 17th September 2011 and resulted in a victory for the North by 5-3. Seven Surbiton players participated in the match including several who defected to the North for the day! 11th September 2011 saw Chris Briscoe make 4/6 in a strong Open section of the Richmond Rapidplay in which Michael Nightingale also participated. The UK Chess Challenge Terafinals were held in Loughborough over 20th-21st August 2011. Koby Kalavannan was the top U9 player in the Terafinal Challengers section C.
On 17th July 2011 Ayse Karel made her now traditional 3/6 in the Intermediate section of the Richmond Rapidplay. On 2nd July 2011 Surrey won the National Counties Open Lowenthal Trophy for the first time since 1954. Chris Briscoe played in the Final against Kent on Board 7. In the earlier stages of the competition Chris Briscoe, Mark Josse and Mike Basman all participated in various matches. Detailed results. Through the Summer of 2011 Surbiton played host to the Surrey Challenge Cup, a section of the Surrey Slater-Kennington Cup and the Surrey Wernick Cup. All told there were a total of ten Surbiton players in the Surrey competitions. Congratulations to Chris Briscoe, who won the Challenge Cup a half point ahead of second placed Paul Shepherd. Well done to Koby Kalavannan who convincingly won through to the final playoff for the Wernick Cup and came second overall. Well done also to Angus James who won his section followed by a play-off to take the Slater-Kennington Cup! July 2011 saw Mark Josse score 5.5/9 in a very competitive Irish Senior Championship. Mark Josse scored 3/5 including a win against GM Alexander Cherniaev in the May 2011 e2e4 Gatwick Open. On 22nd May 2011 several junior members of Surbiton chess club participated in the Richmond Rapidplay. Perhaps the pick of the performances was a 4/6 effort by Koby Kalavannan in the Intermediate section. Other Surbiton junior participants were: Alicia Mason in the Major and Max Elliott in the Intermediate. Good efforts by all of you! Ayse Karel also played in the Intermediate and made another solid 3/6. On 13th March 2011 Surbiton had three entries in the Richmond Rapidplay Open. Chris Briscoe was the highest placed with 3.5/6. Paul Shepherd and Michael Nightingale also participated. Chris and Paul drew in their exciting individual encounter. On 23rd Jan 2011 Michael Nightingale scored a very creditable 3/6 in The Richmond Rapidplay Open. Alicia Mason got an excellent 5/6 and Ayse Karel also got a solid 3/6 in the Intermediate. On 29th December 2010 a club Handicap Tournament resulted in a victory by Martin Durrant with 6/7. See full report. Chris Briscoe won a Thames Valley first team training event on 10th November with 3/3. Ian Henderson won a Thames Valley first team training event on 13th October with 6/7. See also a photo account of the event. The annual North vs South of Thames Valley League match for the Ellam Trophy was played at Surbiton's Fircroft venue on Saturday 25th September 2010. The result was a 3-2 win to the North of Thames Valley team. 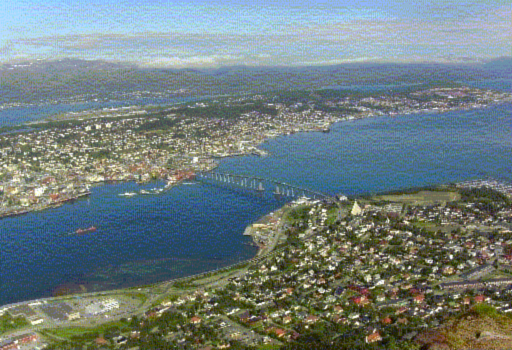 Chris Briscoe scored 5.5/9 in the very strong GM and IM laden Arctic Chess Challenge 2010 in Tromso, Norway (see photo below), from 31st July - 8th August. No untitled player made a better score than Chris! Final table. Ian Henderson and Mark Josse both played in the 2010 British Championship at Canterbury 26th July - 6th August. Their final scores were: Ian (4/11) and Mark (6/11). Well done to both as the opposition was very tough. See Mark's account of the event and Ian's account of the event. Chris Briscoe won the 25th July 2010 British Championship Rapidplay in Canterbury with the perfect score of 6/6.